The Great Biscuit Showdown! McRae vs. Mason! You may remember our recent post featuring Pizzeria 712’s own Taylor Mason’s “Best Biscuits” recipe. Well, there was quite a stir when Joseph Mcrae read the “best biscuits” claim. Joseph is quite fond of his own biscuit recipe and the debate rages. So, we’re asking our friends to help us settle this question once and for all ~ before the biscuits hit the fan! Here’s how you can win. We’re posting both Joseph’s and Taylor’s “best biscuits” recipes, and to be entered into a drawing for a $25 gift card, you make a batch of biscuits using each recipe and then tell us which biscuits you liked by posting your results on your Facebook page. Easy! The bake off competition will run the entire month of February — so you have four weeks to make your two batches of biscuits. Mix all dry ingredients in large bowl. Cube the nearly frozen butter. Use a food processor or pastry cutter to cut the butter into the dry ingredients. Large chunks of butter are okay, in fact, that is what you want. Fold the cream or buttermilk, whichever you prefer, into the dry ingredients just until combined. Do not over mix. For the fluffiest biscuits use a spoon and “drop” biscuits onto a parchment lined sheet tray. Bake for 10 – 15 minutes at 400 degrees until golden and lovely. Best of luck in the drawing and we know you’ll enjoy your two batches of biscuits … we just want to know which one you enjoyed the most! Good luck everyone! What’s New for This Saturday’s Brunch! Damien and Colton in the brunch zone. A well, bacon-greased machine! Satisfying the appetites of our community requires a listening ear to the ground and frequent discourse with the wind. And you thought Joseph and Colton were running around for their health. Anyway, word around the campfire is our friends and neighbors yearn for a leisurely Saturday morning sleep-in, work-out or just a nice long sit on the couch before joining us for brunch. We hope it pleases you to hear our brunch menu service hours at Communal will be 9 am – 2 pm beginning tomorrow. What the heck is “Le Petite Robert style” you ask? This would be the ultimate French fry treatment/brainchild of Colton named for the restaurant in San Francisco where he worked. At the end of the lunch service, Colton would whip up a batch of fries topped with the day’s leftover blue cheese sauce used on burgers. The crew was happy to munch on the fries with a little ketchup on the side. Join our chill brunch action this Saturday! Heirloom’s Star is on the Rise! Thank You Utah Valley Chamber of Commerce! Joseph and Colton proudly display the "Rising Star" award! We are so pleased to have been honored at the annual installation and awards banquet of the Utah Valley Chamber of Commerce! Yesterday Colton was on hand to receive the “Rising Star” award on behalf of all of us with the Heirloom Restaurant Group. Just as the Utah Valley Chamber of Commerce is focused on serving all Utah Valley, we strive to serve our community by highlighting local products as well as the talented and committed people who produce them. We’re looking forward to many more fantastic moments shared with all our friends and partners as we continue to grow with our community. Thank you all so much! Read the story and learn about the other honorees. Dinner Club is a Special Night Not to be Missed! Dinner Clubs are one of our favorite nights because we get to know you — and you to get to know all kinds of great people — while enjoying a carefully selected and prepared five course dinner. Community, it’s what we’re all about and Dinner Clubs are so much fun to host and experience the loveliness that is each other. Our next Dinner Club is coming up in February — Valentine’s Day at Communal! We can’t think of a better way to celebrate with your sweetheart than joining us for Dinner Club. We’ll be announcing the Valentine’s Day Dinner Club menu closer to that day so we can see what’s fresh and going to be perfect … but don’t let that stop you from reserving your spots now. We always fill up Dinner Club — and we promise it will be excellent. Reservations require a $25 deposit. And thanks to Utah People’s Post for this look back to our very first Dinner Club at Communal almost a year ago! Going Local For A Hill Of Beans! Let’s talk local legumes — Anasazi Beans from Adobe Milling in Dove Creek Colorado. They’re now available at your local IFA Country Store. 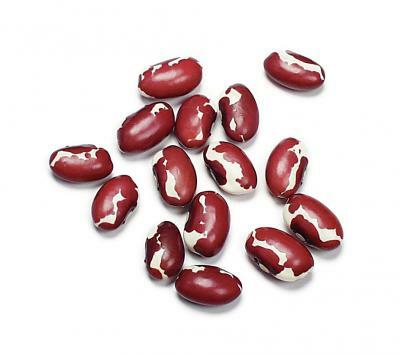 Also marketed as New Mexico cave beans, Aztec beans, New Mexico appaloosas, and Jacob’s Cattle beans, Anasazi beans cook much more quickly than other beans and they appear to have been a part of the human diet in the Americas for thousands of years. Dove Creek is just across the border from Blanding, Utah in the archeological center of the U.S. between The Grand Canyon and Grand Junction in Western Colorado. A fertile and beautiful agricultural plateau, for centuries this area was home to thousands of Anasazi Indians who cultivated corn, squash, Anasazi beans and built the spectacular cities of Hovenweep, Chaco Canyon and Mesa Verde among others. This beautiful region provides us with an excellent source of local, organic Anasazi and Garbanzo beans. 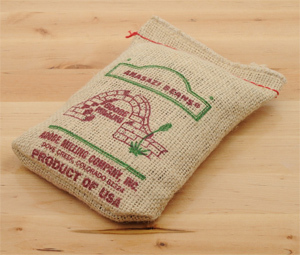 We love the old school burlap packaging Adobe Milling uses for their Anasazi beans. The Anasazi is a tasty, hearty purple and white bean which, in addition to being packed with protein and fiber, is an excellent source of iron and antioxidants. Black, purple and red beans are rich in plant-pigment flavonoids, found in the skin of beans, which serve as indicators of antioxidant levels. The dark coloring also indicates the highest levels of anthocyanin, another pigmented antioxidant. You can learn more about antioxidants in beans and how they are beneficial in this excellent article from Livestrong.com. For a delicious, simple vegetable stew that packs the maximum cold and flu fighting punch, start by sweating in a touch of olive oil and butter , diced onion, carrots, celery, garlic and chard or kale stems until translucent and just tender. Add water or broth, cooked beans, rosemary, crushed red pepper flakes and simmer for 10 – 15 minutes. Finish off with the chard or kale greens and cook until just tender. Soak beans in enough water to cover plus three inches over night. Drain beans and place in a large pot or slow cooker. Add remaining ingredients. Cover and simmer for 8 to 10 hours. Contact Catering Co. for your next event! TGIB (Thank Goodness It’s Brunch)! That’s right, the week is nearly to a close and tomorrow morning Communal will be rocking yet another delicious and chill Saturday Brunch experience! This week’s menu will incorporate some newly developed delights in addition to existing favorites. Enjoy this beautiful Friday and we hope to see you tomorrow morning at Communal. As always, reservations are a good idea but you can just drop by as well. The heritage breed Berkshire pig originated in England and has a long, rich history. From the beginning, the Berkshire boasted superior characteristics and century long efforts have kept it purebred. In fact, The American Berkshire Association was founded in 1875 becoming the first Swine Registry to be established in the world. The Berkshire’s characteristics have been established and purified over a very long period and the Berkshire is indeed a splendid example of an improved breed of livestock. The Berkshire is generally considered the most influential breed of swine in the history of the world. The Berkshire has been utilized as a breeder into many other types of pigs for the marked improvement in meat quality and flavor they create when crossed with other breeds or common hogs. Their superior characteristics of excellent marbling, fast and efficient growth, reproductive efficiency, and meatiness follow them. Compared to the sheer numbers of other breeds and common hogs, the Berkshires are considered somewhat rare. Our Berkshires are raised at Christiansen Family Farm nestled close to the Sheeprock Mountains in Vernon, Utah. At Christiansen Family Farm the Berkshires are pasture raised which results in pork nutrient dense in Omega 3 fatty acids and conjugated linoleic acid (CLA). Christiansen’s Berkshires are also fed locally grown alfalfa/grass hay, Utah grown grains (wheat, barley, oats, and triticale), and fresh produce. You can now follow them on Facebook. We process the Berkshires on site — after they are butchered for us by Gary’s Meats in Payson — to create our house made bacon, hams, sausages and more. All Berkshires have blood lines back to the original England Berkshires and are prized for the juiciness, flavor and tenderness of their pink-hued and heavily marbled meat. This higher fat content makes it suitable for long cooking times so we smoke lots of it. Could we procure mass produced, precut pork products? Sure. But that’s just not our style and we’re sure you’ll appreciate all the benefits of going local with us not to mention the excellent flavor and tenderness of our offerings featuring naturally raised Berkshires. They are indeed a breed apart. Smoke has been pouring out of our smoker as we’ve been working up all kinds of house made delights. There’s not much we enjoy more than the incredible flavors achieved from smoking — and today it was ham and sausage with cherry wood. Local purveyor Ron Dean supplies our woods. Cherry wood makes flavors pop by backing them with fruity, smoky goodness. Fire box sporting cherry wood. Smoke doing its magic dance. Custom cherry wood wheel stop in action - cause that's how we don't roll! We process local, naturally raised Berkshire pigs on site — which are butchered for us by Gary’s Meat in Payson — to create our house made bacon, hams, sausages and more. The Berkshire is a heritage breed with a long, rich history and their characteristics have been established and purified over centuries. Indeed they are a splendid example of an improved breed of livestock prized for its rich, tender, sweet meat. And its superior marbling make it perfect for smoking. Hams on the smoker rack getting delicious. Come see our booth today at the Thanksgiving Point, Utah Wedding Expo. We are there until 6 pm and our gougéres steak sandwiches with pickled onions & arugula are worth the trip alone, but if you need something more enticing come get a couple of our dark chocolate truffles. If you or anyone you know is getting married this year or have another big event consider us, Catering Co., for your catering needs. The simple elegance and freshness of our food creates unique tastes and will help set the perfect mood for your event. If you need help planning your event and your menu come talk to Brittney Farley, with her 6 years of experience in the catering and event planning industry, Brittney can turn your vision into reality. May we also suggest Macie Redd for all your floral needs? She is our preferred florist and custom creates all of the amazing arrangements seen here as well at Pizzeria 712 and Communal. You can contact her directly at 801.602.7491. Catering and floral services are available all over Utah so no matter where your event is being held we can help make your special event fantastic! Contact us today!